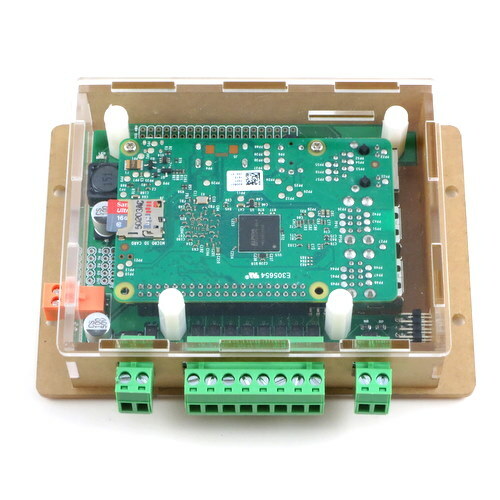 OpenSprinkler Pi is an extension board for Raspberry Pi (RPi) (RPi 0; RPi 1 Model A+/B+; RPi 2; RPi 3). It allows RPi to directly access and control sprinkler valves. It comes with a set of laser cut acrylic enclosure. – Includes laser cut acrylic enclosure (as shown in the picture). – RPi is NOT included, no LCD; 24VAC transformer is NOT included by default but is an optional add-on. – Due to the power consumption of RPi 3, if you plan to use RPi 3, you may need an additional USB adapter to power RPi 3 directly through its microUSB port. 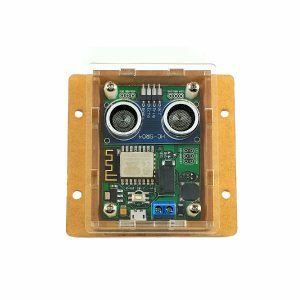 – The enclosure WILL NOT fit RPi 1 Model A or B (i.e. oldest generation of RPi). 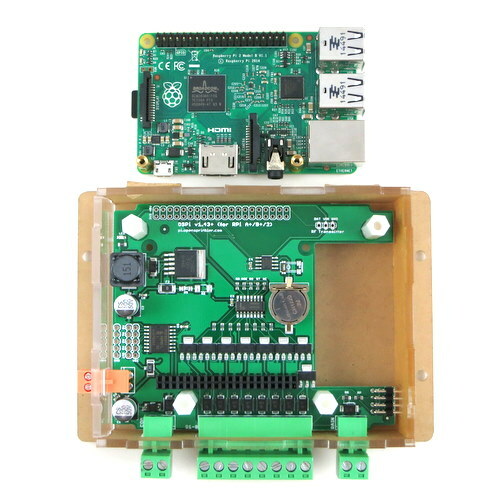 OpenSprinkler Pi (OSPi) is an extension board for Raspberry Pi (RPi 0; RPi 1 Model A+/B+; RPi 2; RPi 3). It allows RPi to directly access and control sprinkler valves. It comes with a set of laser cut acrylic enclosure. Note: The enclosure of this version WILL NOT fit RPi 1 Model A or B (i.e. the oldest generation of RPi). Also, if you plan to use RPi 3: due to the power consumption of RPi 3, you may need an additional USB adapter to power RPi 3 directly through its microUSB port. This product requires prior experience with RPi, since you will need to install OSPi software on your own. 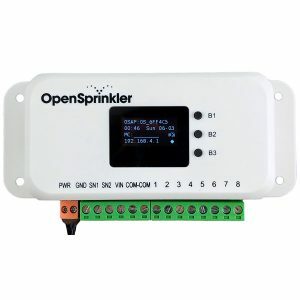 If you are looking for a sprinkler controller that works out of the box, please check out the fully assembled OpenSprinkler. Comparisons of OSPi with other OpenSprinkler products. OSPi is designed as an extension board that makes use of RPi’s GPIO pins to directly control sprinkler valves, without an additional layer of microcontorller and Ethernet controller. In other words, it is a circuit board that allows an RPi to directly interface with sprinkler valves. Single power supply design — the same 24V AC sprinkler transformer powers both sprinkler valves and RPi. Built-in real-time clock (RTC), A/D D/A converter (4 input and 1 output channels), rain/flow sensor terminal, zone expansion board connector, and transient voltage protectors. 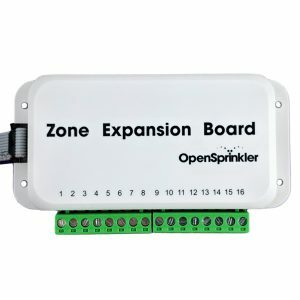 Expandable — one OSPi supports 8 zones; expandable to 72 with OpenSprinkler zone expansion boards. Control from anywhere — use any modern browser, or use our free apps for iOS, OSX, Android, Kindle Fire, Windows 8, Chrome, and Firefox. Automatic weather-based water time adjustments — use online weather data to auto-adjust water times based on temperature, humidity and rainfall. One assembled and tested OpenSprinkler Pi board. Laser cut acrylic enclosure and screw terminal blocks. 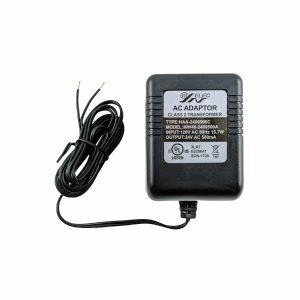 24VAC Transformer (not included by default, but is an optional add-on). If you have an existing sprinkler controller, you can reuse the transformer. This is an awesome kit! Everything is included. It is very well designed. I was able to get it working with Google calendar and Weather Underground. I have 8 zones and it works flawlessly. This is the best Pi project yet! This was a great project and really fun way to get into Raspberry Pi’s. Was able to setup and configure the RPi before I received the opensprinkler unit. Then once it arrived I was ready to install the RPi and secure everything in the opensprinkler case. I modified the Hunter exterior case from my previous controller and the OSRPi and 24v transformer fit in with minimal modification. I live in Phoenix, AZ and I was worried about the heat in the sealed enclosure but it has been running solid since I installed it and the RPi peaks at around 80c during the hottest part of the day. I’m running v1.0.6 of the sprinklers_pi UI by Richard Zimmerman which has been running perfectly. It would be great if the opensprinkler or RPi had a 2-pin fan header so I wouldn’t have to hack something together to get some air moving. If you don’t live in Phoenix you shouldn’t have any heat issues. My next project is a halloween/christmas RPi light controller. Ray, make us a project!! Thanks. Great kit with clear instructions and quality components. All worked perfectly. Only adjustment I made was to use wicd-curses for wifi as the default setup did not reconnect for me on router resets. Next plan is to improve garden sensors so that schedule can auto adjust more efficiently. Highly recommended. I usually don’t take time to write reviews. I was so impressed by the product I felt the need to. The system was so fast and easy to setup. The ordering process was easy and came quick like amazon. If you are on the fence like I was just order it and save yourself the hassle of the other systems out there. The only thing I wished was an easy way to hook up an LCD. Not that it really needs one and would be mainly for show only. 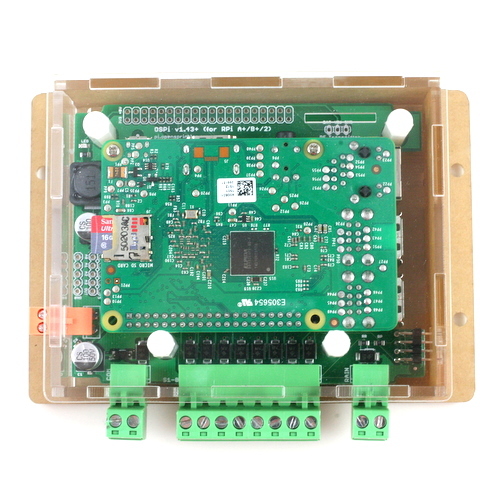 I have been programming Raspberry pi for a variety of home automation and SDR projects for some time now but this one caught my eye, since i wanted to upgrade my old sprinkler controls with an advanced, WiFi/Cloud/App based module and had a spare Raspberry Pi B+ lying around. I was able to get it up an running within few minutes but it took me few hours to pull the old unit out of the wall and wire this awesome open source gizmo. Its been running for over a month now w/o any issues. I might figure out a way to add the LCD module and may be write few python scripts to send additional email/sms notifications. This thing was awesome and worked out of the box! I got the Raspberry Pi at Fry’s and set up OpenSprinkler software on it. Once this hardware came in (and the expansion board), I plugged it all up and it all worked! Great product and fun to control my sprinklers from my phone. Saved money and has a much nicer interface than the old Hunter manual controller. Awesome Kit! Bought it the end of February 2017. Arrived in mail early March. Had a warm spell, so I pulled the obsolete Rainbird and installed OSPi. Electrically tested it out same day. Just had my first chance to charge the system and do a live test. This system is gonna work out well for me and was way cheaper to retro-fit it to an existing system. I have had this Raspberry driven machine for close to two years. It was straightforward setting up and has worked flawlessly since. The ability to remotely control over the internet is so so handy!. The app for my android and iOS is simple to use, very capable and reliable. This works great! I like this much better than any commercial product out there. It is reliable, responsive, fast, and very easy to put together! I like the fact I can run two zones at the same time as well…something I’ve always wanted to do. Thanks for all the hard work put into this! It just works! The only trouble I had was self-inflicted on a firewall setup for Internet access of the app. I have had one of these for a few years now. It has been rock solid. I have six zones on 5000 square feet of landscape and the OSPI on wifi. It is so easy to manage and adjust for the seasons. Having an app for the phone is a plus. I can just turn on the sprinklers wherever I am in the lawn and make the adjustments needed. No running back and forth, no running sprinklers in the rain.. My water bill is a perfict bell curve over the year. Works out of the box and high quality. Very easy to setup if you have basic Linux experience and can read instructions. Exceptional value given the features. I love OSPi, it does everything I want, I have total control, unlike the Toro brand that I was using before. The ease of set up was amazing! Thanks, Ray for an incredible product! So Simple, and not a lot of overhead for a Pi 2. This is one of the simplest pi projects I have implemented. This can be setup within an hour, and utilization on the pi2 is less than ~4% CPU Utilization and 8.5% Memory. The Website is the only-thing that uses any real load on the Pi, which is why appears as simplistic, but is really so that it can be lightweight with next to no changes. I had an existing sprinkler system, and it was an rip and replace install with no modification needed. My OpenSprinkler arrived broken during transport and Ray was kind enough to send me a replacement. The OpenSprinkler is very easy to set up with some minimal Linux administration knowledge and the manual and instructions are clear. I’m using it indoors with a 24 V AC water pump, instead of the suggested solenoid valve and works as intended. To be noted that the Raspberry Pi 3 does indeed (as advertised in the product description) require more power than a simple 24 V AC. 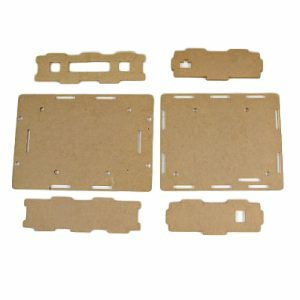 This requires feeding the Raspberry Pi 3 through its microusb port and remove that side panel or cut a square of adequate proportions.